The Swifts face title rivals Anstey Nomads in a top-of-the-table clash that will obviously have a big say in the destiny of the United Counties League Division One crown. The pair have been sparring at the top for most of the season with very little to split them. And that remains the case as they go head to head at Anstey’s Cropston Road ground with the Swifts three points clear of their hosts but having played a game more. The encounter perhaps comes at a good time for Lutterworth as their opponents have won just once in the last four matches and were knocked out of the County Cup 3-0 at home by Loughborough University in midweek. But Dixon believes recent results will not not matter when it comes to the most important match of their campaign. “It’s a really important game, obviously – definitely our most important so far,” Dixon said. “And it will be a tough one. I don’t think there has been more than a couple points between us all season really so it’s going to be tight. “I don’t want to say it will decide who wins the title because it is too soon for that. “There will be many twists and turns still to come. “But a win in this one really could push one side to go on and follow it through. “If we win it will give us a bit of daylight at the top which we haven’t had. “I was saying to the lads that Nomads probably need the win more than we do and coming away from there with a point we would probably be fairly happy. “They’ve also had a bit of a blip. But it is difficult to know at this level how long a blip will last. “Their latest defeat was to a good Loughborough side so that would not have been easy for them. “The one thing that we hope might help us is that Loughborough are very fit and strong and Anstey would have been made to work hard. “Hopefully there is a bit of tiredness left in their legs on Saturday. Little margins like that could make a difference. While Anstey’s form might have taken a knock in the last couple of weeks, Lutterworth have recovered from dropping points in December to make a 100 per cent start to 2019. And Dixon added: “We’ve sorted ourselves out a bit again and performances have improved. “The players have got that focus back and we’ve got a couple of wins under our belt. “Wins change things and we’re back feeling good and we’re ready for Saturday and looking forward to it. Lutterworth Athletic have also started the year well. Having had to wait nine days to get back into action after new year, they have sealed back-to-back away wins at Rushden & Higham and Thrapston Town. They play at home on Saturday for the first time since December 21 when Sileby Rangers are the visitors. 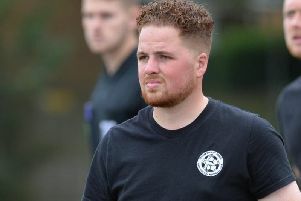 In the Premier Division, Harborough Town lost their third match on the bounce last weekend when Newport Pagnell edged it 1-0. This Saturday sees them face a tough test with third-placed Deeping Rangers visiting the The HTFC Community Ground.